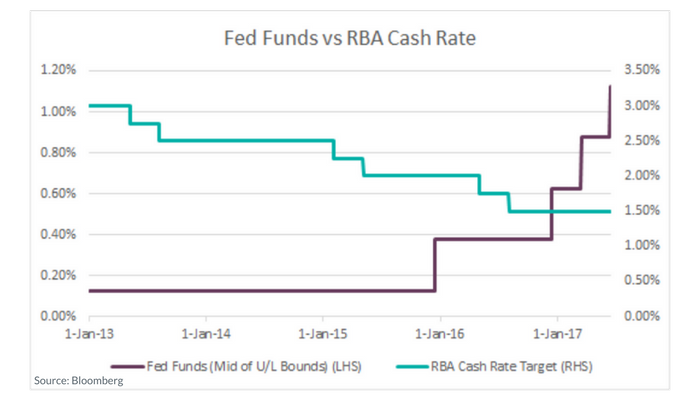 On Wednesday night we saw the US Fed raise rates for the 2nd time this year taking their effective cash rate to 1%. Below we discuss the effects on rates, both in the US and Australia, as we see a divergence between the two Central Banks. The market is expecting another rate hike from the Fed by the end 2017. I believe, as does the market, that the hike will be at the end of the year. Looking forward to 2018, the market has also priced in three rate hikes over the course of the year. Bond bears (sellers of bonds) in the US have recently been frustrated. On Wednesday night we saw lower inflation in the USA, which is generally a case for rates from the central banks to remain on hold/be lowered. However, the Fed is looking through inflation figures hoping to see an upturn in inflation. If they are disappointed, bond bulls (buyers of bonds) will have the upper hand (be rewarded). Commentators have noted the “old rule” that treasury yields peak before their first tightening. In my opinion, this would mean that 3% would be the upper limit for US 10 years, as this was the rate when the Fed began tapering. I used 3% as an upper limit in my December 2017 note “A tale of two curves”. In Australia, the market is pricing the possibility (albeit small) of a cut in the short term and only approximately a 50% chance of a rate hike to 1.75% in November 2018. Even though rates are lower in Australia than the peak in March.